The other night I went out for drinks with A, and luckily I was carded. Weird that I said luckily, right? Well, I always find it awesomely fun to be carded. It reminds me of how young I actually am, and it always takes me back to a moment I had back in pre-school. I was in this Art Club at my school and the teacher would always have juniors and seniors from the high school come in to help teach and pass out the art supplies. One day, I asked the assistant how old she was and she replied with "I'm 18." I remember being super shocked and even told her "You're so old! You're almost 20!" Yes, back then at the tender age of 4, I thought being 20 was the end of the world and that it would put me in the "Old People" category. What would my 4 year old self say if she were to meet my 24 year old present self? Well, for sure she would laugh at me for all that I have to do now to stay looking and feeling young. I bet a lot of you can relate. There's the morning moisturizer with sunscreen, the nighttime anti-wrinkle cream, the waxing and salon appointments, gym memberships, oh, and all the stuff in the eating department too. Drinking tons of water, trying to avoid caffeine, not eating carbs so late at night, and all those new diets and ways of life such as "paleo" and "clean-eating." I'm not even going to get into fashion and all the ways we use it to our advantage and all those cheats we all like to use on the daily. One thing I would do, though, if I had the chance to talk to my little-kid self, is I'd make this quick bite for us to snack on, specially since I've always been a tomato girl. I would even eat tomato sandwiches just because Harriet the Spy would! How many of you remember THAT movie?? This recipe is so simple and quick to make, that what took me the longest was chopping up the tomatoes and the onion. Everything combines really well to give this appetizer a light and refreshing bite and as I've said, you'll have it ready in no time at all. Just in case you wanted to put a seafood spin on this plate, I'm adding a variation at the end of the post for you guys to try it out. 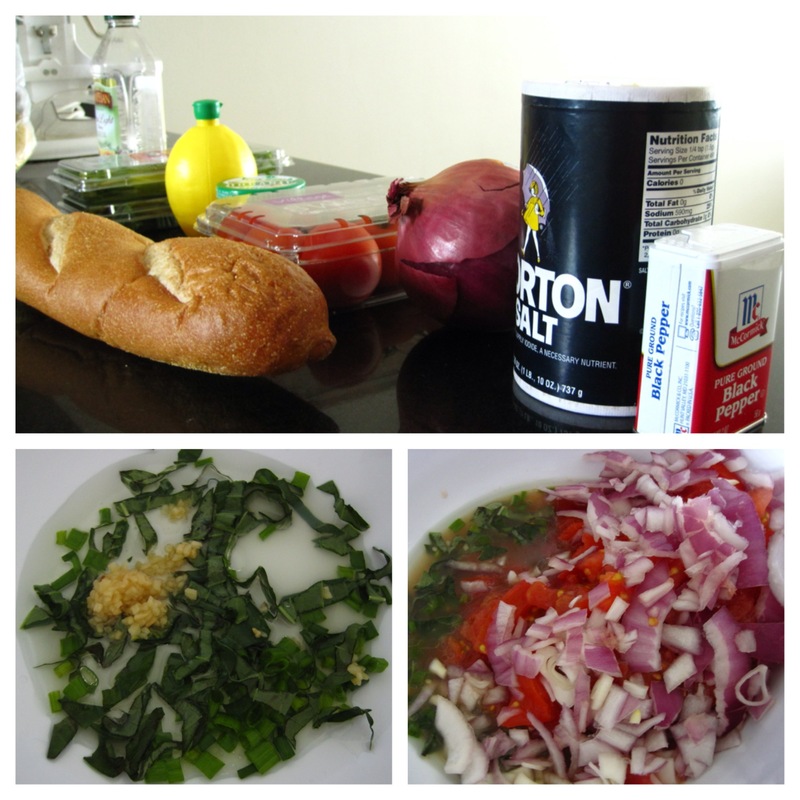 1) In a medium bowl stir together olive oil, chives, basil, lemon juice, and garlic. Add tomato and onion; toss to coat. Season to taste with salt and pepper. Set aside. 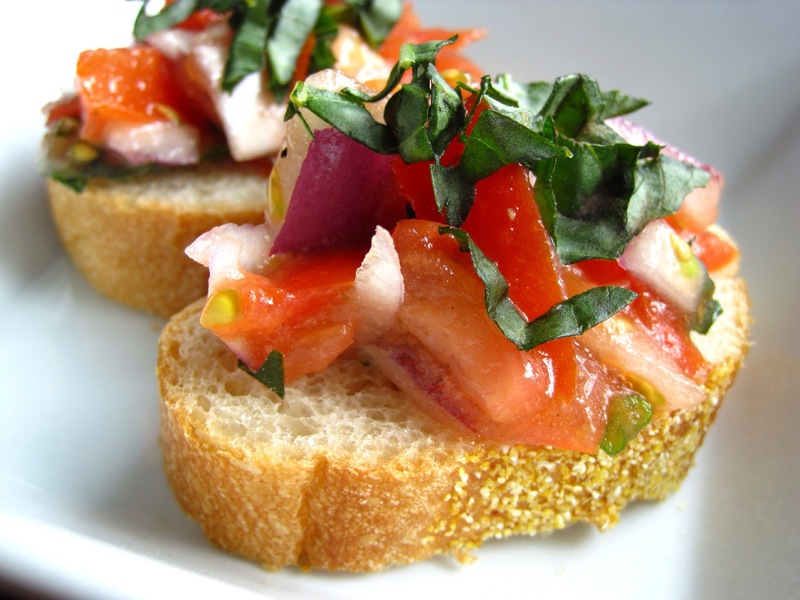 2) To serve, use a slotted spoon to spoon tomato mixture onto each toast slice. Garnish with fresh basil. Serve within 30 minutes.